A self-propelled vehicle speeds silently through the sky carrying 300 passengers. 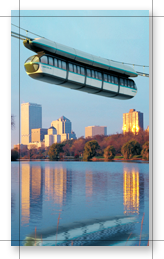 Riding high above congested freeway or gliding over rivers and other impassable barriers, it is the last word in transit technology. Called Aerobus, this proven system is economical to install, environmentally friendly, and pollution-free. Utilizing a patented cable suspension concept, Aerobus is the only solution for certain difficult alignments. And Aerobus may be configured to move people or cargo. Aerobus installations have operated safely and reliably for millions of passenger miles and have been favorably evaluated by specialists working for the U.S. Department of Transportation.